Looking for the ultimate, all-in-one portable PA system? The new EUROPORT EPS500MP3 sets up in less than five minutes and delivers articulate,high fidelity performance, yet weighs only 41.3 lbs/18.8 kg. With its dual 250-Watt amplifiers and custom-designed 2-way loudspeakers, the EPS500MP3 can easily fill a medium- to large-sized room with crystal-clear, vibrant sound—and it’s professional-grade features will make you the star of any event! Since BEHRINGER is known for making some of the best-sounding audio mixers, amplifiers and loudspeakers on the planet, it should come as no surprise that the EPS500MP3 provides far superior sound quality than other products in this class. 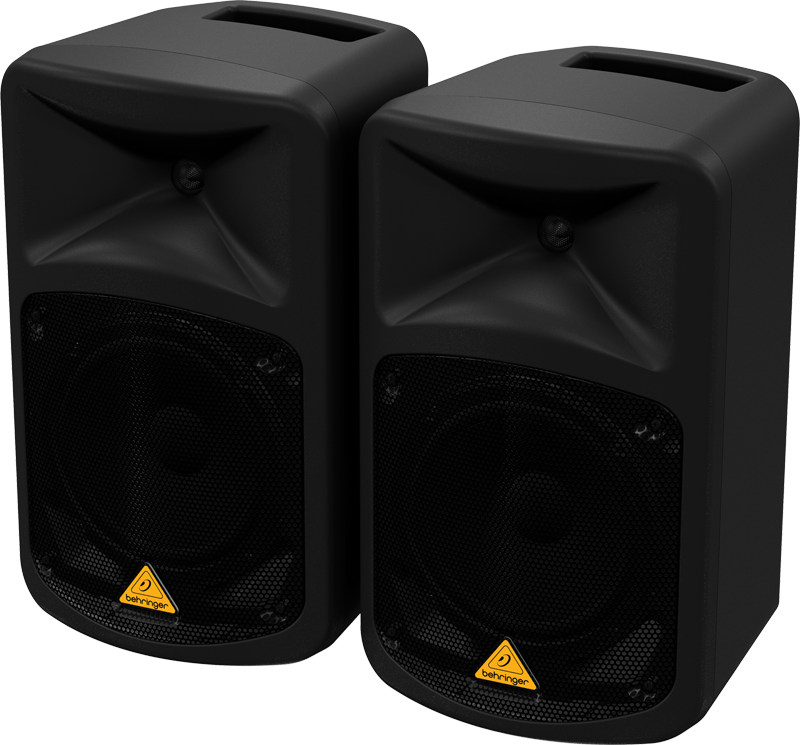 The two satellite loudspeakers,each with a custom-designed 8" woofer and 1" compression driver, provide the rich sonic performance you would expect from a much larger system.And with 500 Watts of stereo output,the EPS500MP3 has the power to deliver your message loud and clear, and keep the party going all night. When it’s time for the show to begin, setting up the sound system should be easy, right? That’s why we put everything you’ll need into one beautiful,easy to move and use package. We even provide a storage compartment for the included microphone, mic cable, two speaker cables and other accessories.You never have to search high and low for what you need—it’s all in there.And when the show is over, just put everything back in its place, latch it all together and wheel it away. It just doesn’t get any easier than this! Channels 1 – 4 feature our high-quality XENYX Mic Preamps, which have been praised by audio professionals for their transparency and massive headroom.What does this mean to you? It means you get a truly clean input signal without unwanted coloration or distortion. We’ve provided +48 Phantom Power, so you can even use studio-grade condenser mics,and given each input channel our highly musical 2-band EQ (Bass and Treble). System optimization couldn’t be easier,just flip the Music/Speech switch to select the proper equalization for your purpose. We’ve also included a user-defeatable Voice-Over-Priority function that automatically lowers the stereo channels when you’re on the mic, so all of your important announcements will be heard. If you’re making a speech, chances are you won’t need it, but if you’re playing a musical instrument and/or singing,you might want to add some effects. So, we’ve included a great-sounding digital Reverb processor to help sweeten your performance. This studio-grade vocal effect will have you sounding just like a pro, and it is so easy to use. One of the coolest features of the EPS500MP3 system is its embedded MP3 player. Just plug in your favorite playlist (via USB stick) and use the 4-button pad with its Random, Play/Pause, Rewind and Forward control switches. From break and background music to high resolution karaoke performance tracks,this MP3 player can handle it all. Until now, adding wireless microphones to a PA system meant either a mess of wires and dangling receivers or worse, a built-in receiver with dodgy performance and a hefty price tag. Those days are officially over thanks to BEHRINGER ULM Series wireless microphones and our exclusive, ultra-compact 2-channel receiver. Just plug the receiver into the dedicated wireless port and instantly enjoy two channels of supremely stable, natural-sounding wireless performance. Sold separately and available in hand-held or headset models, BEHRINGER ULM Series wireless mics will immediately (and affordably) expand your EPS500MP3 to handle virtually any live sound application. The EPS500MP3 comes ready for your input, literally. 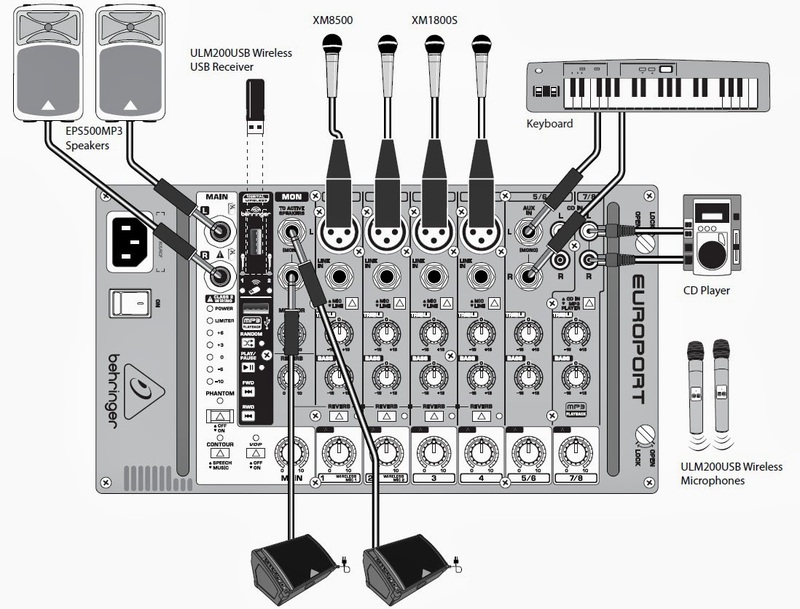 Channels 1 - 4 accept balanced XLR mics, as well as balanced and unbalanced ¼" line-level sources,such as electronic keyboards and the like.Stereo channels 5/6 and 7/8 accommodate RCA and ¼" inputs, such as drum machines,keyboard sound modules, etc. All in all,there are enough mic and line-level inputs to handle a small band. 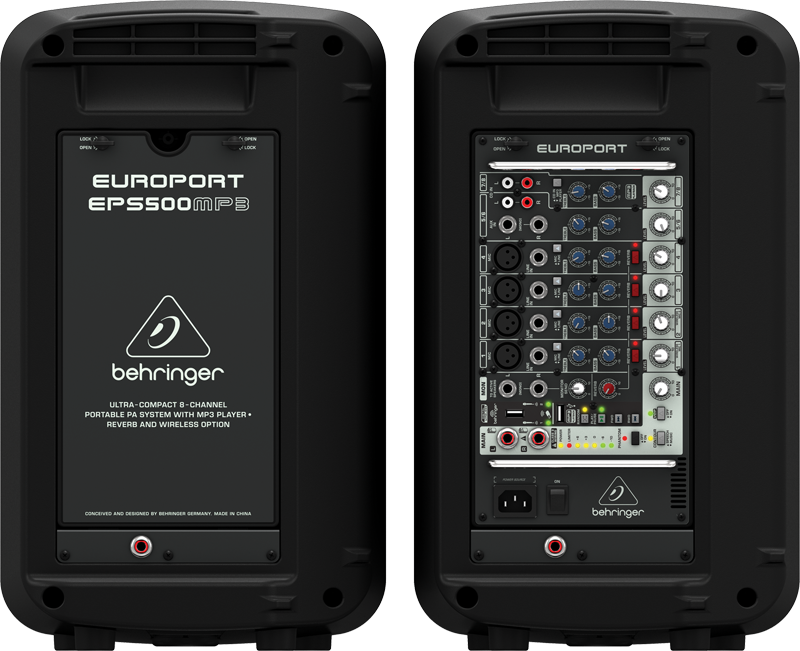 Whether you’re giving a speech at the company picnic, pounding out original music in your garage, or cranking it up at the neighborhood bar, we think you will agree the EPS500MP3 provides extreme value as a complete, portable PA solution.Compare it to the competition and you’ll own BEHRINGER—every time!